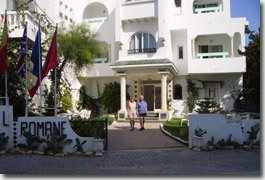 60 Km from Tunis the capital, Hotel "LA RESIDENCE ROMANE" is situated in the pretty coastal Town of Hammamet positioned by the sea and just 2 Km walking distance from the town centre, it makes the perfect holiday location. RESIDENCE ROMANE offers all the modern conveniences comprised of 42 various rooms (double, triple, quadruple) and 5 apartments, set in traditional garden surroundings. All rooms are fully equipped and comfortably furnished with central heating, air condition bath/shower, telephone and terrace, TV fridge location possible. To swim, we have provided for you an Adults & children's Swimming Pool with a Private beach. Joining our commercial centre (Restaurants, snack bar, Pizzeria, Bazaars, Games room, Hairdresser, Café maure...). The Hotel offers a varied weekly entertainment programme (Folklore, Shows, Gala Dinner...). As a family run business, we pride ourselves on providing a reliable, Personal and highly professional service making your holiday a memorable one with us and at very competitive price. We remain at your full disposal for any further information or assistance.